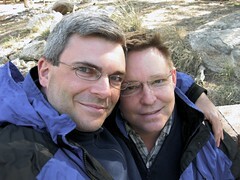 Andy & I first laid eyes on each other five years before the day we posed for this photo during our camping trip on Mount Lemmon. We’re still in love and as happy to be together as ever– even more so. We bumped into each other getting in line for coffee at Claire de Lune coffee house in North Park (San Diego, California) on a Saturday morning, May 24, 2003. About all we said was “Hello!” and “Good morning!” and I wanted to meet him but I was busy having a meeting with a friend and he was busy having a meeting with some friends. Luckily, we met two days later, May 26, at a Memorial Day pool party. And we’ve been together ever since. This is the first year since we met that the days and dates we met coincided again. The Rich Can Play Prisoner!